I finally decided to get on with my life and have surgery. It was life-changing. Frank always dreamed of flying. It’s all he ever wanted to do since he was a young child growing up in Ohio. 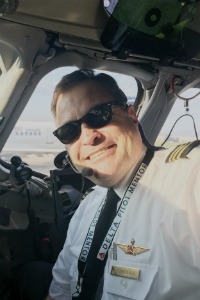 He’s been living out that dream since 1989 while serving in the active duty navy, then serving in the air force reserves pilot for 17 years, and now as a commercial pilot. At the age of 50, Frank feared he may never fly again when arthritis in his hips caused excruciating pain in his back, hips and knees. 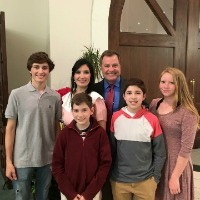 The pain also prevented him from enjoying activities with his wife and four children, including an annual trip to an amusement park. Their favorite park is Silver Dollar City in Branson. In July of 2017, Frank was referred to Kansas Spine & Specialty Hospital by his air reserves physician, where he had a consultation with orthopedic surgeon, Dr. Damion Walker. Dr. Walker diagnosed Frank with osteoarthritis in his hips and scheduled him for hip replacement surgery on his left hip in August. The surgery was performed utilizing the Robotic-Arm Assisted Surgery System, which offers patients faster recovery times due to smaller incisions and decreased risk of injury to adjacent healthy tissues. 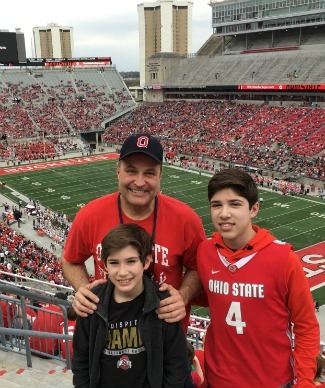 In December 2017, Frank had surgery to replace his right hip. In addition to reduced recovery time, the Robotic-Arm Assisted Surgery technology enabled Dr. Walker to get great precision in the alignment of the hip prosthetic implants, straightening the alignment of Frank’s hips. Frank is grateful for Dr. Walker and the staff at Kansas Spine. He said the personal attention he received and the ability to have his own private room truly aided in his recovery. He also added that the food was outstanding. July of 2018, Frank and his family were able to celebrate his birthday by visiting Cedar Park amusement park in Ohio, riding roller coasters and enjoying quality family time together. Photos: Frank enjoys an active lifestyle with his wife and four children, including flying, riding motorcycles, going to sports events, and water activities. If you speak another language, free language services are available. Call 1-316-462-5000.